Happy Birthday to me! In celebration, I want to share with you all a very special friend of mine, a beautiful and noble beast who is tragically loathed and feared by nearly everybody I know, even friends who otherwise love invertebrates. But first a word about why. Growing up in suburban Los Angeles, rarely does one come upon a great number of large or interesting insects. The worked-over sprawl has mostly relegated most invertebrate diversity to areas where the desert still holds sway. Growing up in biological wasteland, it is easy to see why suddenly coming across a giant creature in your garden can be an unwelcome shock. Nearly every kid in Southern California who had to clean their pool has come in contact with the carcasses of these giant insect monsters that have stumbled over the edge and drowned. For decades I have encountered friends, acquaintances, and outright strangers who have run to inform me about the disgusting and terrible monster bug that they recently saw, and how it scarred them for life. Before they can go into its description, I would usually cut them off mid-sentence and say, "Does it have a large bald head, fat stripey abdomen, translucent skin and spiney legs?" "YES! How.. how did you know!?" They'd gasp. Of course, what else could it be, I would think glumly to myself. For no other invertebrate, no invasive ecology-killing species, disease vector, crop pest or venomous predator in all of this region inspires as much vindictive dread in the Western United States as the distinctive and regal creature shown below. I just don't get it. I can see how some people fear ticks, spiders, ants, snakes... but these guys? With their cute sanrio-style faces and brilliant stripes? Their admirably sculpted legs and slow dumply movements? Honestly, they're like the golden retrievers of the insect world. Big, slow and kinda goofy, but essentially lovable. And boy do I love them. 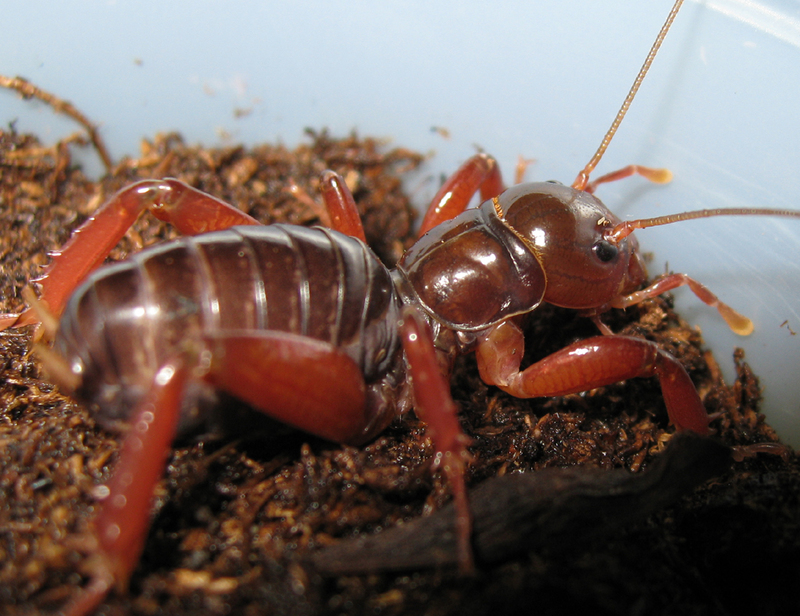 If there was ever a workhorse emissary of the Endless Swarm, it would be the Jerusalem Cricket. 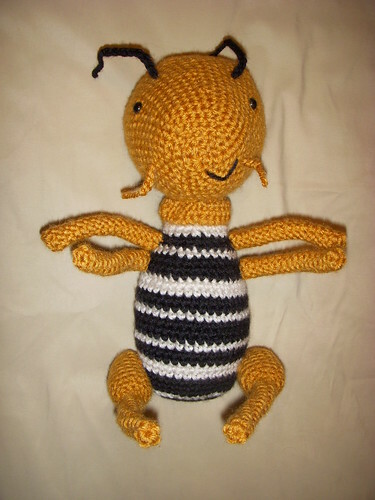 Adorable 'Potato Bug' by Maggie Keith! I mean, just get a load of that thorax! It's like it was carved out of rare mahogany! And speaking of carving, or any art in general, that's one place where the Jerusalem cricket really stands out. Or rather, stands underground. Because there isn't a lot of artwork celebrating the Jerusalem cricket. No sculptures, statues, paintings, suncatchers, kid's books, anything. At least none that I can find in any frequency. But there is one glorious exception, and its name is Susöpa, the Cricket Katsina of the Hopi. Susöpa is a Hopi Katsina spirit, part of a larger body of beings that are often called Kachinas. Known as a runner who challenges young males to sprints, Susöpa is often depicted with grass and feather antennae surrounding a round dome decorated with wide dot-like eyes that mimic the Jerusalem cricket's giant bald head. I found a lovely article published in American Entomologist by John Stoffolono and Barton Wright that delves into the biology of the Jerusalem cricket, and its influence on Hopi culture, and the various depictions of Susöpa by Hopi artisans. Check it out: Sösööpa—Jerusalem Cricket: An Important Insect in the Hopi Katsina Pantheon. Even more wonderfully, Susöpa is also not the only insect Katsina. Dragonflies, wasps, and scorpions also have spirit counterparts. An august body of invertebrate beings! Susöpa is usually depicted carrying nothing, or sometimes a small yucca whip that he playfully hits other runners with! It is these images, of a lowly burrowing cricket that is celebrated and revered, that I shall leave you with. Because they're simply beautiful. This entry was posted in art, insect, JD and tagged Birthday, cricket, Hopi, jerusalem cricket, Katsina, stenopelmatus, Susöpa. Bookmark the permalink. I love this post! 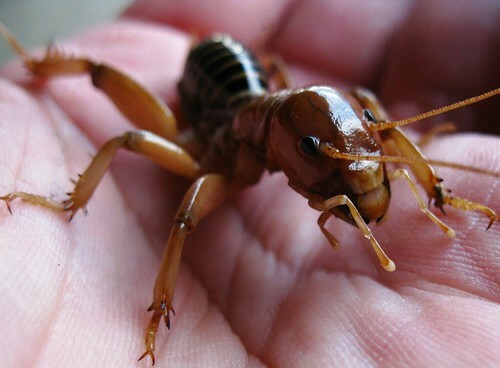 I get questions about Jerusalem crickets from scared parents all the time and am always shocked by how deadly people think these little bugs are. You describe it perfectly, how you know immediately exactly what they’re talking about. I have also always loved kachinas (I don’t actually own any, but I studied them in my art class in high school and I’ve carved a few myself just for the experience), so the mix of the bugs and the kachinas makes me really happy. Thank you! I had no idea there were so many insect kachinas before writing that post. Hornet, bee, dragon fly, scorpion, cicada, butterfly… Each with a distinctive representation. Amazing!